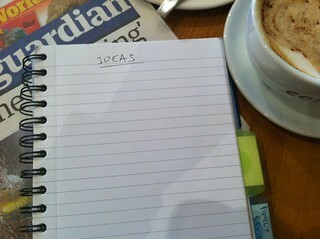 I journal every day and if good ideas appear I start writing them. I keep a note on my phone of every single idea I ever have so I’ve always got some to fall back on. Er.. if all else fails a strong glass of whisky usually helps. Oh, and turn off the internet. Greetings sir. Can I say that I really enjoy your style of writing, which it must be said has a far great natural ‘flow’, than my own stop-start prose. I have launced myself into the void of National Novel Writing Month (http://www.nanowrimo.org///eng/user/758927) which as you can see is progressing quite slowly. It must be said though that the proposal to write 50,000 words and *not* a novel as such is a wonderful incentive, as it removes that mental stumbling-block of having to produce something worthy of publication (and public reception). It recognizes the truth of what you describe above – just write. I like the standing up and saying it aloud prompt – and Justine’s duration of a cup of tea incentive. Failing those, you could always make this part one in a series of…. however many on the subject of Writer’s Block. Wow, thanks for the feedback folks! Milo that does sound like a good idea. I go through phases of recording as many ideas as I can. The journal approach probably structures that to some extent. And yeah, the internet does while away pointless hours! And Emmet, thanks a million for the compliment. I appreciate it. I do have to throw in that you clearly don’t suffer from writers’ block based on your blog’s brief, not to mention your November novel project. I noticed that. I think if I have the time I’ll try it next year but it’s too daunting for now! Justine, I love the Zen idea. I guess a deadline helps. Working on the assumption that we leave everything close to the deadline, it would seem that without one we’d be lost! Haha, Paul maybe I could. I think I might not get as much interest after a few pieces! Oh for an edit function. That post of mine is simply filled with typos. But that brings us to my point, which is that writer’s block largely comes from a fear of how others will receive what you write. The trick is not to worry about that, as you will be rewriting everything once finished. Emmet I always make a total meal out of comments in terms of typos! It tends to take some of the umph out of whatever input I have frm my own point of view but I honestly don’t think many people notice, unless they’re those vitriolic types who spend all day on the comment sections of the big papers. Tony, great suggestion! This could be combined with that Victorian occult-ish ‘free writing’ people used to do. Actually I should have included both of these int he text of the piece! Why not just pack it in altogether? Accept that writing is probably not your forte, and move on to something else? Well, ‘a reader’, you responded to the question, so you must have read to the very last word. Quite an achievement for me as a writer, to hold your attention that long. PS, first bitchy comment on the blog. I must be ready for guardian.com. The bubbly is open! Keep your hair on, it was only a suggestion! A suggestion I won’t be following up.